Perhaps the most recognized cactus in Las Vegas is the barrel cactus. It is not hollow, as many believe, but has a spongy pulp inside. When growing, most barrel cactus lean to the South. It is also known as the bisnaga, red barrel, fire barrel, solitary barrel and compass barrel cactus. This cactus has flat, greenish jointed stems with rose or lavender flowers from March to June. The height is 6 to 12 inches and frequently found in dry, rocky desert flats or slopes. 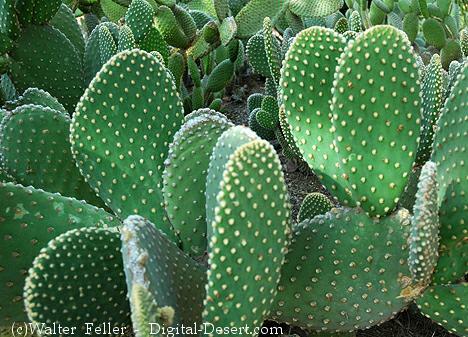 The beavertail cactus looks like the prickly pear, but does not have long spines. It has tiny hair-like spines instead. The cholla (pronounced "cho-yah") cactus has jointed stems that are tubular. 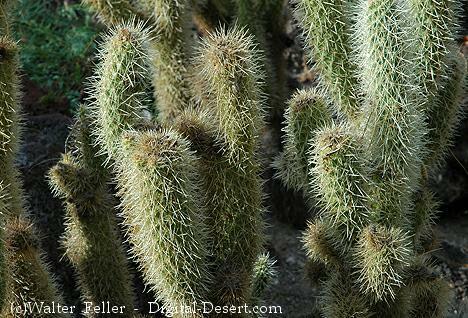 These joints can break off and take root in the ground to grow a whole new cholla cactus. After the plant dies, a skeleton of "ventilated wood" remains in the desert. There are many different kinds of cholla in the Mojave Desert. This large shrub has small, round leaves which look and feel oily or sticky. This coating called "lac", helps to keep water from being lost to the dry air. Indians used lac as glue. Mexicans called this plant, "little stinker". This common plant has inch wide yellow flowers. These flowers look like small sunflowers on tall stalks. The marigold's fuzzy leaves grow at its base. The flowers of this small colorful plant are barely visible. A "brush" of bright orange or red surrounds the tiny flowers. The top of the plant looks as if it has been dipped in paint. 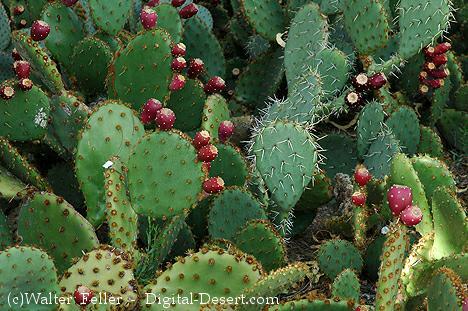 There are many kinds of prickly pear cactus (nearly every state has a native species). Most can be recognized by flattened stems, called pads, that grow from joints. Indians would carefully scrape or burn off the spines and cook the pads for food. The egg-shaped fruits, called "tunas", can still be found in some grocery stores. This plant is found in dry, rocky places or on canyon walls in the desert. A rounded, bushy plant with stinging hairs and flowers, blooms from April to June. The flowers are cream or pale yellow in color. Do not pick the flowers -- the stinging hairs are vicious! This plant is unusual for the desert. The datura is vinelike with large, grey-green leaves. The flowers look like large white trumpets, several inches long. It is sometimes called the "moon-lily", because the flowers open at night. This is when the Giant Sphinx Moth pollinates the flowers. It is also known as "jimson-weed" or "thornapple" because of its round, spiny seed pod. All parts of this plant are poisonous.